That's coool. I'm not a good programmer, but I'm looking forward to the contest! Condor is cool, but it causes too much of a performance penalty (I get 18 fps with it). Maybe try cutting back on the antennas. Try one on each side instead of 5. Ultimately though the real killer is probably shields and trusses. If there's anything you can do to trim those even a little it would probably give a large performance boost. - The torpedoes undock and push themselves sideways a bit before accelerating to full speed. - The radiators are placed in that parallel configuration to minimize losses in effectiveness due to radiating toward one another (ignoring the inside faces anyway). - The general design involves some clipping, but it's not unheard of for real rockets to have tanks and other parts modified to fit tightly against one another as depicted here. - This is intended to be essentially a workhorse scouting ship for long-term voyages with a relatively small crew. BTW, a question: regarding "alien" ships, what is the general guideline regarding the "Design Guidelines"? I get that the humans and presumably any race that lives in an environment conducive to producing human-like technology (i.e. temperate terras) should be realistic by human standards, but what of exotic lifeforms or other races that simply came up with completely different ideas for spacecraft? The Fire Dragonfly, for example, is a current stock ship that goes way outside the guidelines. parameciumkid, this does not meet several requirements. You cannot have parts intersecting/clipping through each other. Also, no matter how "efficient" the warp rings become, the field geometry would not change. So the size and position of the rings relative to the rest of the ship would not change. The way you have yours positioned, the ship would destroy itself as soon as the warp field was activated. Also, you should use one-sided radiators to achieve what you're trying to achieve with the cooling system. The Fire Dragonfly, for example, is a current stock ship that goes way outside the guidelines. It doesn't meet the requirements for a human ship, perhaps, which will be synonymous with a player ship in the game, but it certainly meets every requirement when it comes to realism. Read here for the details of its design, it is every bit as carefully thought out as any other stock design. Still need a name for this ship but I've made some adjustments. Made front shield more rounded with less of a cone, removed old hyperdrive module, and adjusted radiators. I've narrowed down my collection of ships to just four entries. Some of which have multiple configurations. I put them all in an Imgur album with descriptions and links to the SSS files here:<a class="link" href="https://imgur.com/a/l1dm1" rel="nofollow" target="_blank"> https://imgur.com/a/l1dm1 </a> I'll also duplicate it all here on the forum for convenience. These all get decent FPS on my system, but I've got a relatively high-end machine so I don't know how well they measure up in general. Harmony IIb Extreme Range Explorer. This first ship is the end result of my pre-Alcubierrie-ring tinkering: the Harmony IIb Extreme Range Explorer. 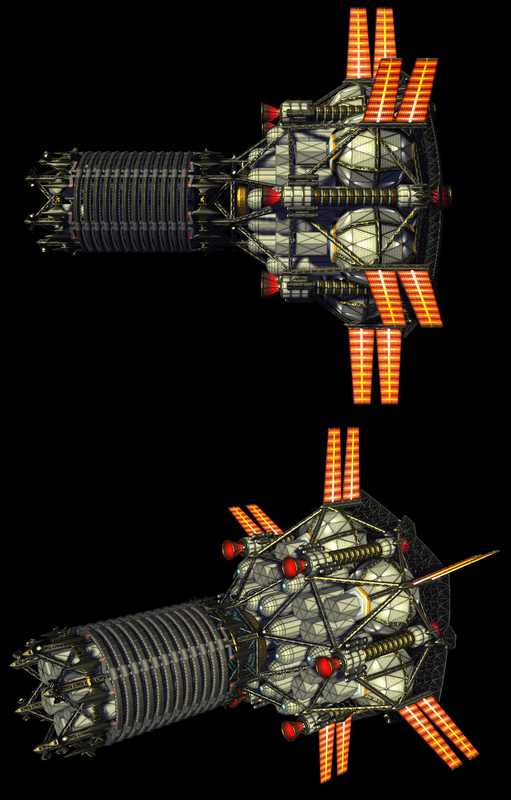 It's intended as a self-sufficient exploration/colonization ship, with a large crew capacity and an extremely large fuel payload to allow for extended trips with many stops before needing to settle down for a while to refuel and refurbish (and presumably to plant a colony in the process). It has 8 of the large spherical hydrogen tanks and 18 cylindrical deuterium tanks and a large complement of cargo bays to carry the equipment necessary for its various functions. It's also got 24 torpedoes, just in case. The dual-direction drives mean it can always present the fuel payload as an additional layer of shielding to the prograde direction, protecting the passenger portion of the ship from cosmic radiation and catastrophic impacts with the fuel's bulk. Then the Alcubierie rings were added to the editor and I decided to start fresh using those instead of the bronze spinny ring array thingy. My first attempt was something I dubbed the "warp barrel" due to its barrel-like shape. This has 3 hydrogen and 12 deuterium tanks, six fusion drives, and has the neat feature of tucking the habitation rings *inside* the deuterium tanks for improved shielding from all directions. I made the fusion drives mono-directional because I imagined that whenever it wanted to switch from acceleration to deceleration it could simply decouple the shield, flip over, and then reattach the shield on the other end. I also wanted the ship to have an identifiable "front end", it would have been almost completely symmetrical otherwise. I suppose the drives could be swapped with double-ended ones easily enough if that's preferred. I switched to the thick Alcubierrie rings and decided to leave some space between them and the core of the ship, imagining that the warped space they produce is none too healthy. The result was a nicely designed STL ship embedded inside a FTL "cage" that would carry it from system to system. I imagine that whenever this ship arrives in a solar system it parks in a distant orbit, detatches and extricates itself from the warp drive, and then zips around the inner solar system without the massive encumbrance. http://www.mediafire.com/downloa....ngs.sss - the drive rings, left behind and waiting for the core ship's return. The trusses at the ends are splayed out slightly compared to the docked configuration, giving clearance for the ship to slide into place. This is a variation on the Spindle design approach with more STL "oomph." There's three fusion drives, three hydrogen tanks, and nine deuterium tanks. 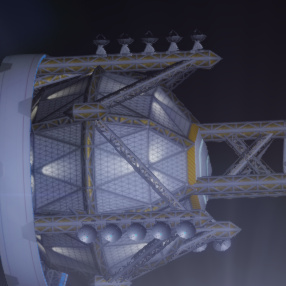 The shield can be mounted on either end of the ship for acceleration and deceleration (The "prow" of the ship has a small section of shielding mounted on it that fits into the hole in the shield that the engines poke through) and the warp rings can be detatched for in-system travel. Full ship rigged for FTL with the shield mounted on the front for acceleration, showing off more of the trusswork. I wound up with five separate SSS files as a result of these different configurations, which probably means this one's not going to be very useful as a default ship. And the drives are clustered together, which turns out to be considered dubious as well. Oh well. I think it looks pretty, and perhaps some of its configurations are suitable on their own. http://www.mediafire.com/downloa....ing.sss - The FTL drive rings. 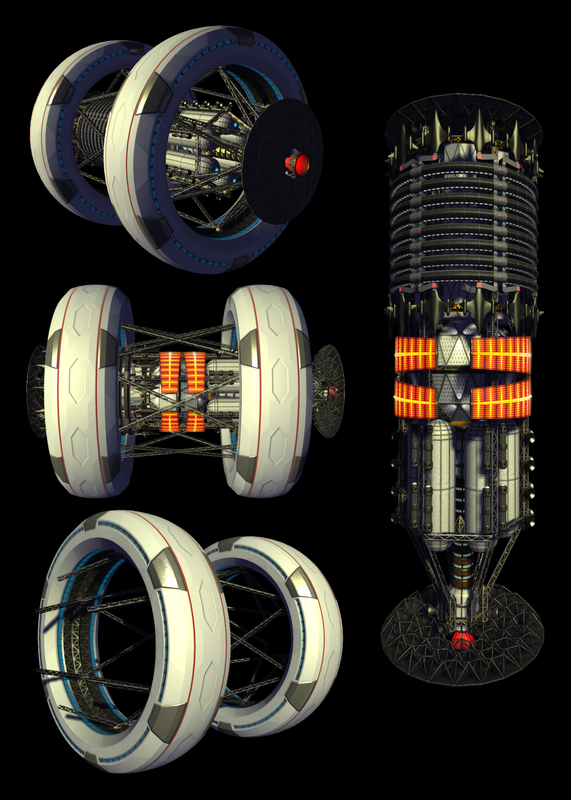 This time I didn't leave them spaced out, I imagined that extricating the core from the drives would be a more elaborate engineering process and so I had the rings simply docked together and imagined all the extra trusswork was packed away in a cargo pod for storage. Here I am, at the last moment, I'm readying this up out of my own inspiration. I tried to make them smaller and less demanding so you can spam them freely without performance drop. I admit, I did not look too deep into the "mothership" requirements, so most of them are in the different class, but if anybody asks I can improve them towards your ideal. There are 7 ships, all packed in one archive. Of course, you need the SHW texture and model pack to be installed in your SE so you can have these spaceships, which can be found there http://en.spaceengine.org/forum/17-1292-1. It took a couple of evenings to make everything more or less working so I'm just going to present it here. Unfortunately, the main issue is that current version of SE is not supporting "offset" parameter, as Space Engineer said, so some of the models are visibly shifted off center mass and will require some tweaking eventually. 1. Fast Cargo Ship - meant to be unmanned platform with warp capabilities (the only ringed spaceship in the pack), manufactured with latest technology. There are 4 small "ears" visible on the front shield, that will protect constructions, and two large ones to protect radiators that will remain unfolded. The engines are two-way, and the frontal nozzles are protected by rotating shield (at least in theory as SE does not support animations). 2. 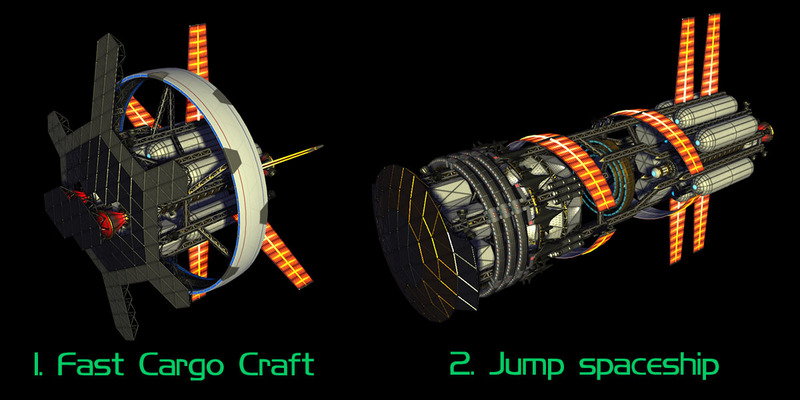 Jump Spaceship - this is standard exploration craft with jump capability, the older version of engine. 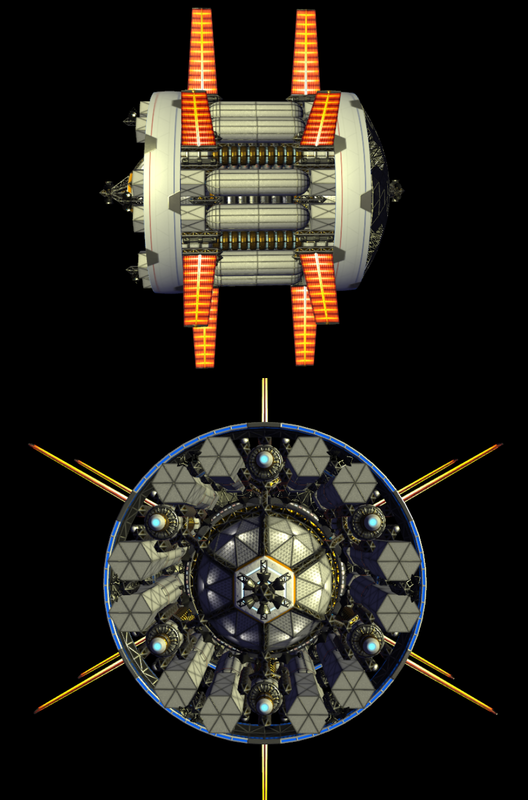 The engine is mounted approximately in the center of ship, so that there's enough space for it to wound up. This is the one that (more or less) agrees with general rules, so if you have any demands, feel free to respond. These are planetships, so they lack jumping capabilities. 3. Planetary Cargo Ship is your general hauling craft, with main engine replaced with bunch of less powerful engines (which are "photon torpedoes" in the editor). It can go to impressive speeds and smash through planetary rings, but has a little use beyond single planet system. 4. Fuel Scoop is an unique spacecraft, designed for capturing atmospheric hydrogen of gas giants. 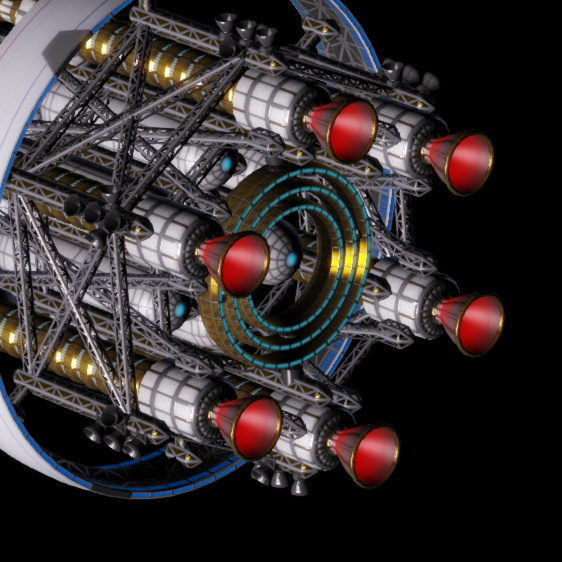 It is small, it has a lot of engines and a special fuel bay that can store some compressed fuel. 5. 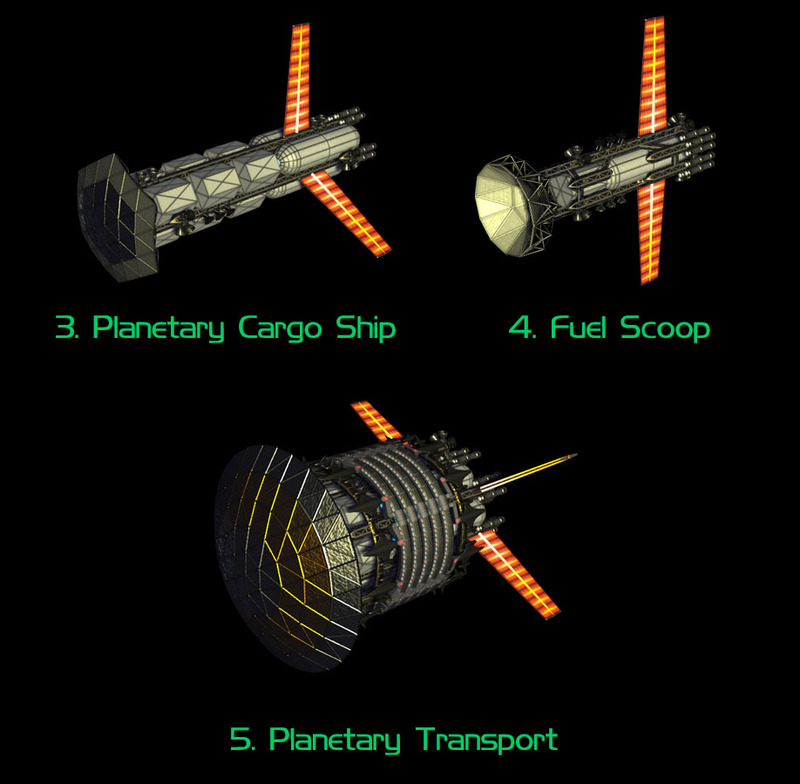 Planetary Transport is a large interplanetary ship which has a lot of cargo and habitable space, as well as powerful engine, but its range is as short as that of any other planetary craft. 6. 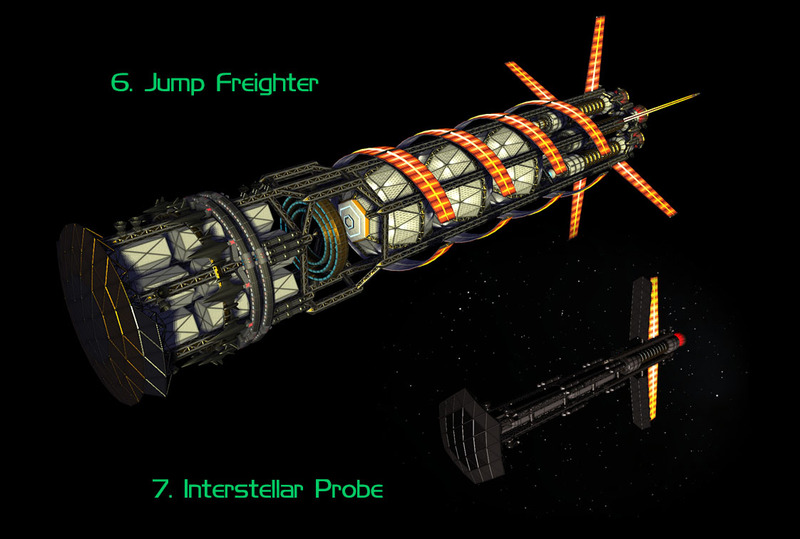 Jump Freighter is a huge starship which uses the same principle as Jump Spaceship but carries a lot of cargo and fuel reserve and a lots of engines. 7. Interstellar Probe was one of my first (after a long pause) attempts at spaceship building for this contest, so I accidentally lost it's source file, and only a model file left. The probe is used for long-range search of early epoch and does not have any superluminal engines, but it is quite powerful. I like this concept and will rebuild it if anybody is interested.